I am learning generosity here in the Philippines. But not just any generosity. Creative generosity. I've never had so little money in my life. Yet I've never been able to be so generous. I am learning that true generosity, truly sharing a blessing, has nothing to do with money. It's about creativity and intent. And those are mine to give at any moment! From intent flows creativity-- the more creative your generosity, the more you are giving, and the greater the blessing all around! About as many pesos as would buy two Starbucks coffees enabled Sarah and I to buy the healthiest ingredients for a massive batch of banana, oatmeal, cinnamon, raisin, wholewheat pancakes. 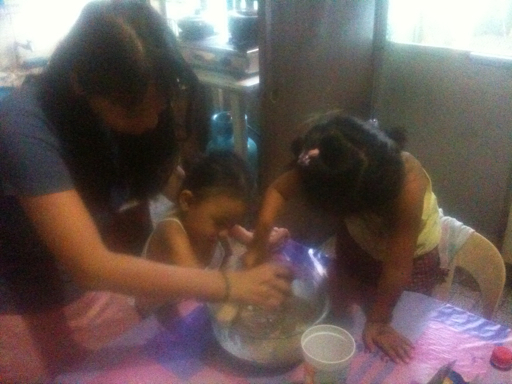 We got the local kids involved in the cooking. Kids that get very little family attention or artistic opportunity. 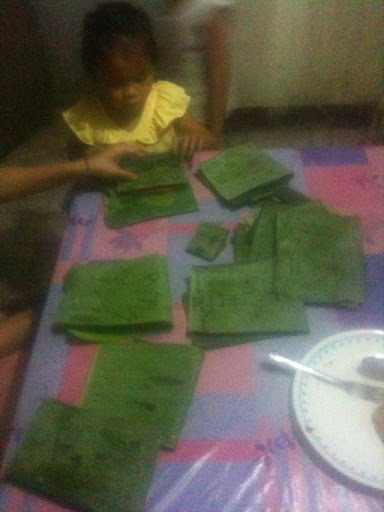 We then got them drawing on the banana leaves that we would be using as wrappers. 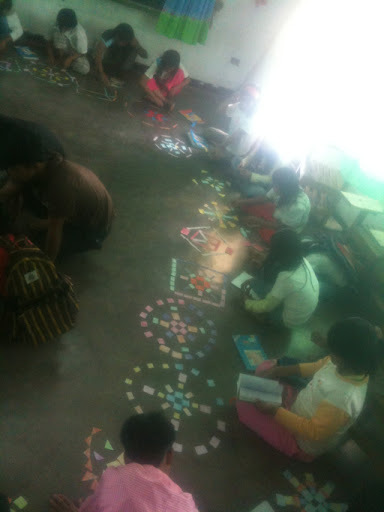 They had a joyful blast drawing shapes and smiles and people and animals to decorate them. The rest of the family came into the kitchen to watch and help. Everyone got into it as they learned of our homeless food production plan! Sarah has now been commuting around the city with the pancakes on hand to give away. People are always asking for food. Or maybe you just see them sleeping on the streets. 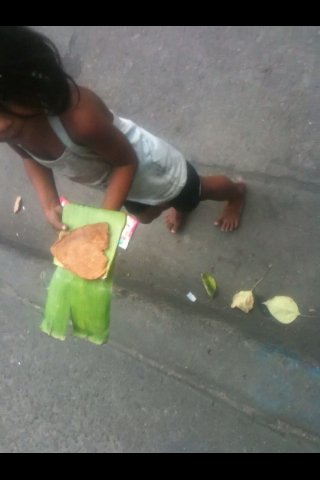 Just imagine being alone in the dark on the street then being handed a homemade, love infused, banana pancake, packaged in children's drawings! Sarah shared with me the other day that after handing some pancakes out, the couple called back to her-- "The children who made these are heaven sent!" I just got back to Sagada from my week and a half stay in Manila. My decision to go to Manila was made on the fly while visiting another village. I jumped on the bus with only one change of cloths and a small bag. I had three shirts, but alas only one pair of pants! Oh my, it's good to be back in Sagada. Fresh air, quiet, and... Clean pants! What a 12 days it was though. I am still reeling from my intense and momentous time with Sarah, the president and the Muslim and Christian youth. Yes, at times I really wished I had a change of pants. But openeness to the creative flow is what being an artist is all about. Stepping out of comfort into challenge and the unknown is where the creativity magically flows. 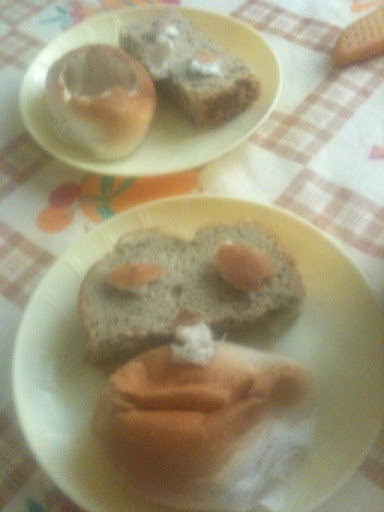 Wether it's modifying some breakfast buns or making a mandala with the president, the most authentic and brilliant creations are strangely unplanned. Indeed, it's when the universe has a chance to work with you. 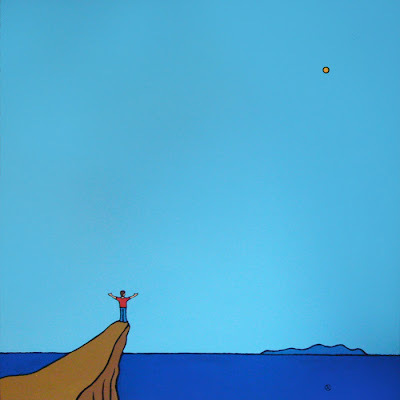 Art, and dare I say life, is all about accepting what you've got in your moment and creating, and loving, grandly. This was my way of making breakfast for Sarah one morning. Yesterday, Sarah and I made the long trip out to Caloocan, the barrio outside the city where Eric and his group of Muslim - Christian youth leaders live. These are the amazing kids that helped us lead the workshop with NHC high-school to make the clay candle holders for the peace ritual. The youth leaders were challenged by four times as many kids showing up than we had planned-- yet came through brilliantly. That's us posing in the photo above. The purpose of our visit yesterday was to process the experience with them. These kids live way out of the city and just as far from the polical machinations of the country. To suddenly be on TV and meet the president was a major experience. I am glad we made it. Sarah and I saw how much emotion and thoughts they had to express. We went around the circle and shared. Here's some of what came out of it. "Nothing is impossible if we work together"
"Even though it looked impossible to teach so many kids, I learned that if the intention is good, beautiful things come of it." "It was my first time to do something for change"
"When suddenly we had to work with 16 kids each [instead of the planned 4 per youth leader], I was like 'Can we do it?! 16 youth!'. But the kids were smiling so much with the clay that even though we were all tired the tiredness went away and we were able to show them all how to do it"
"I was soooo nervous when we were doing the rituals with all the officials"
"It was my first time face to face with the president"
"I got to see myself on TV"
I've been working hard lately. 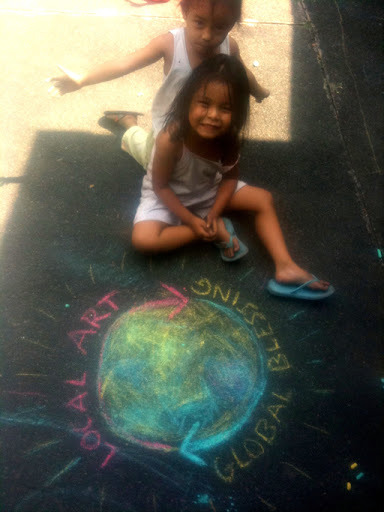 Not just at making local art, but on global systems to facilitate global participation. It's got me thinking about the relationship between the two that will enable the synchronous spread and manifestation of both a local blessing (like the Guina'Ang 1Book library) and a global blessing (like the Candles for Peace mandala or the mandala that will come from the Guina'Ang project). I am really proud to post this one. My partner Sarah and I have been hard at work over the last week. And before that we were hard at work with lots of kids to make this happen. It was so cool how it all came together magically. This time last year, I was writing alot about 'co-creation' and even 'supra-sexual-co-creation'-- the idea that by harnessing the distinct male and female creative energies, we can create, heal, and acheive in ways far beyond what we can do individually. This creation-- a harmonious blend of my creativity, Sarah's, and everyone elses'-- is a fantastic example of co-creation in action. It wasn't easy. The co-creative process brought up all sorts of ego and artist and personal issues for Sarah and I-- but the end effect of letting go of ego and working synchroniously together was... this! Kinda like when two waves combine to create a tide that surges far further than the ones before and gets your shoes wet. 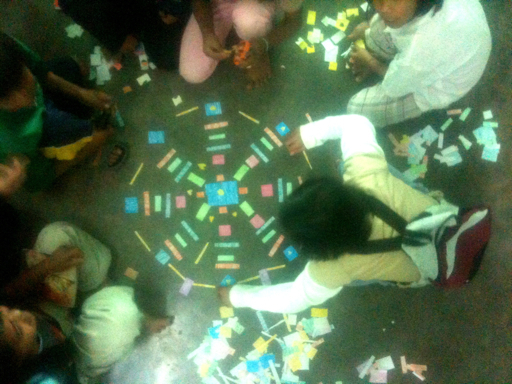 A Mandalic co-creation featuring President Aquino and 400 Children. After decades of conflict, long awaited Peace Talks are set to resume between the Government of the Philippines and the Moro Islamic Liberation Front (also with the National Democratic Front and the Moro National Liberation Front). Four hundred children from diverse faith backgrounds gathered with artists, ritual leaders and indigenous musicians to channel the power of art and ritual for peace building. On February 7th, 2011 the children were invited to craft terra-cotta candle and flower holders inspired by the Tri-People culture of Mindanao. The next day the children were joined by the President of the Philippines, leaders of the military, universities, police, government agencies, and NGOs for a ritual lighting of a peace mandala of candles featuring their clay creations. It was the call of the children to end armed conflict in their generation. It was a celebration of the end of the cycle of war, misunderstanding, and separation. It was a reminder of our interconnection across lines and generations. United, one light at a time, peace will shine. *The project was made possible by United Muslim-Christian Peacemakers' Association of Tala, Peacemakers' Circle Foundation, 1Mandala, GINHAWA, and SangHabi. 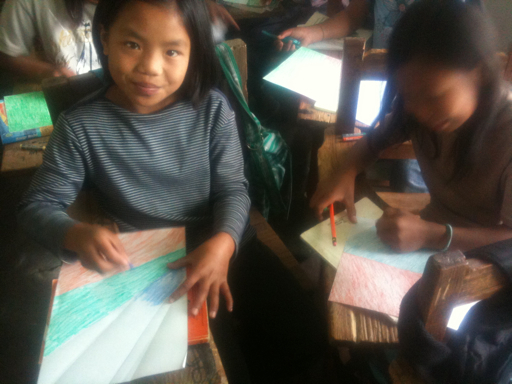 With the 1Books that have arrived in Guina'ang, so too has arrived a box of pastels. 1 Box to precise. Thanks Dan! While there I figured I'd do a little mandala workshop. Boy did the pastels come in handy. It was like a scene from the Bible. The one box of pastels somehow got broken up, divided, shared around (like the loafs and fishes) and was used by a class of 50 students! The class happened to be doing a lesson on fractions and ratios. 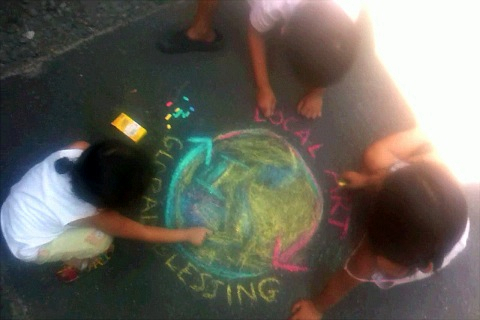 We incorporated that into mandala making. The children choose a number and divided their paper accordingly. Working with a given fraction of their favorite number, they divided their paper up into sections of color. 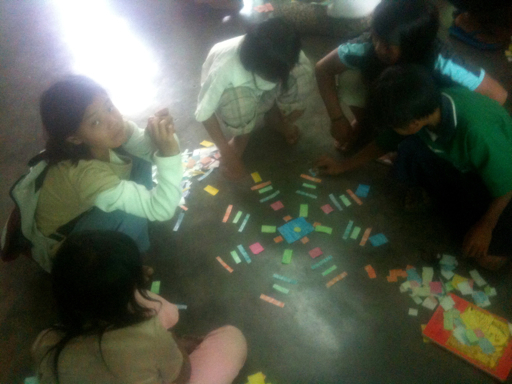 Then, I gave them another fraction, and they cut up their colored paper into pieces. 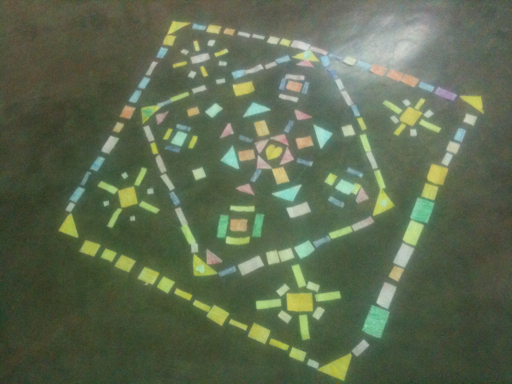 And then we made Mandalas! Their Mandalas became iterations of their favorite number. 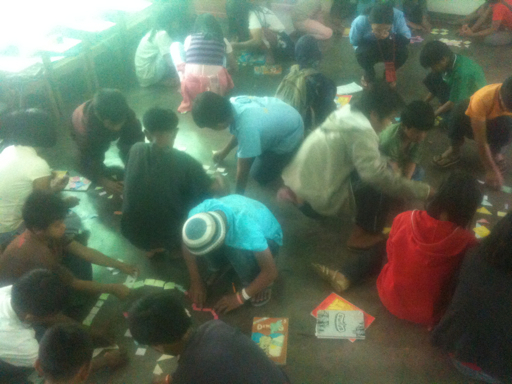 They were so keen that in the afternoon we went ahead and built collaborative Mandalas. More on that in my next post. I am in Manila this week on a spontaneous co-creation with my lover Sarah. This weekend, long awaited international peace talks resume over the war torn province of Mindinao in the Southern Philippines. To help launch the talks we orchestrated with the presidential staff a mandalic peace ritual. Sarah was instrumental in ensuring this ritual that drew on Philipino roots was part of the event. And, it was by far the most successful and engaging part of it. 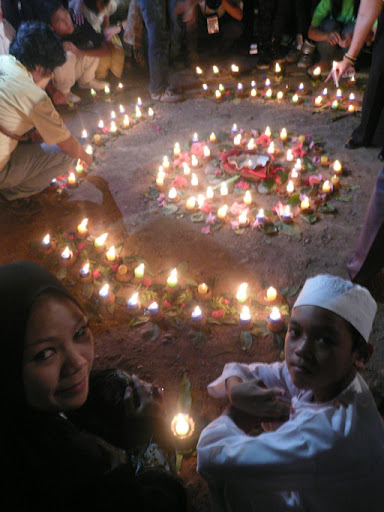 We began with the co-creation of clay candle and flower holders with 400 kids of diverse faith backgrounds. That's alot of kids! Its a minor miracle it worked out. 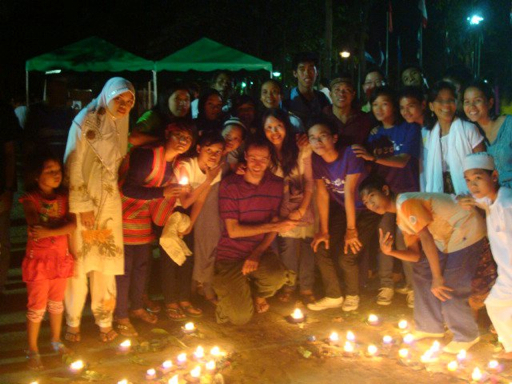 We had the amazing help of an interfaith group of youth leaders from a Manila neighborhood. 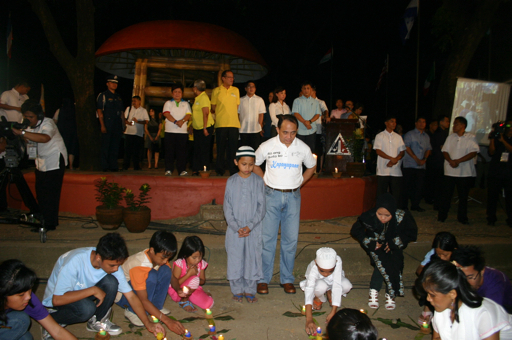 The holders were arranged with leaves and flowers to make a candle lighting ritual that was assisted by president Aquino, his generals, government and spiritual leaders, and of course the kids. The youth partook in the ritual directly. The president just said a speech. It was way more fun working with the kids! What is the way to peace and harmony? It is to be peace and harmony! That's what the mandala making process was all about. Here's the full Facebook gallery. The artists: Sarah and I, the youth leaders. 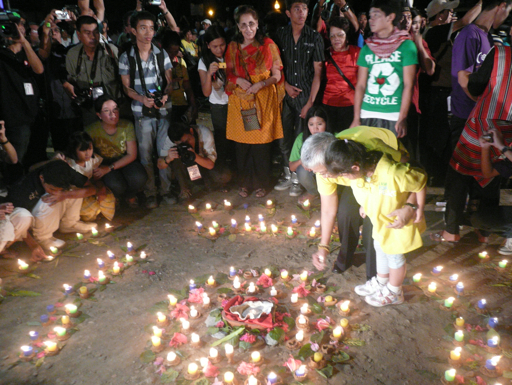 The Secretary for Peace lights a candle with her grand daughter. I made the long trip into Guina'Ang the other day. I absolutely delighted to see the first pile of 1Books that have arrived. How amazing to see the parcels from all over the world there in that little village high in the mountains! Even more amazing was to see the smiles on their faces as they opened up these beautiful books and flipped through them. The small group that helped me sort through them were thoroughly fascinated and could barely put them down. We're really on to something powerful and amazing with the 1Action concept. It chilled me to the soul to witness the blessing coming together there in the mountains. We're learning lots from this first one! It's taking much longer than we thought, but its happening. 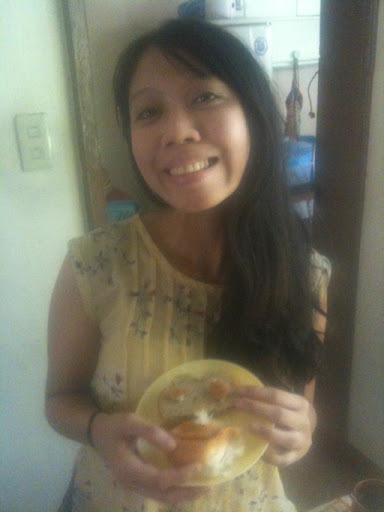 I can't wait to go back next week to the school with Sarah (who's coming up from Manila!) to do the second artistic component of the project. In the meantime, we're hard at work on a revamped website and social systems to coordinate the next 1Action. Dan sent in 1box of pastels with his book and that precipitated and amazing mandala making session with 50 kids while I was there. One box made such a blessing! That's already giving us new ideas! I am a little delayed getting the photos up as I am having iPhone challenges. First thing though, I wanted to share these photos with you guys! You'll recognize your books i think! A second batch of books awaits in Manila still. Completely on the spur of the moment, I took off on the 12 hour bus ride to Manila yesterday. I am here co-creating with my lover Sarah, an extraordinary art project that celebrates the return to peace talks in the Southern Philipinnes this month. I was honored to lead this workshop with Sarah and the Interfaith Youth Workers in Manila today. We expected 100 kids, we got 400+! Nonetheless, it was a great success. Using clay, rice and seeds we spread the raw materials all around to create candle holders for a peace ceremony tomorrow. We arranged the finished holders in a mandala this afternoon. Tomorrow we continue with a ceremony to be attended by government officials. 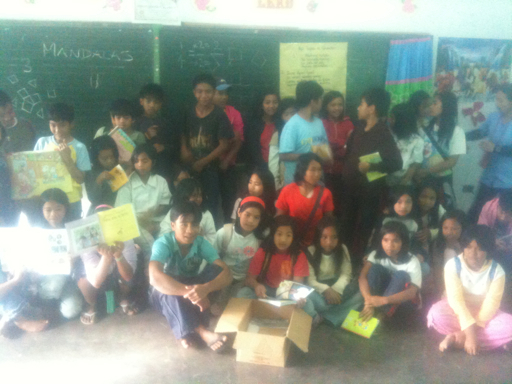 The other day I was finally able to make it back to Guina'Ang village and school. Alas, I only had one day to visit. My purpose was to see the 1Books that had arrived and to touch base with the teachers. However, to have some fun, I offered to do a workshop with one of the classes. It had been a good two months since I was there last. Imagine my surprise and delight to find this on the chalk board when I and the principal walked into the grade four class! The principal was going to introduce me. 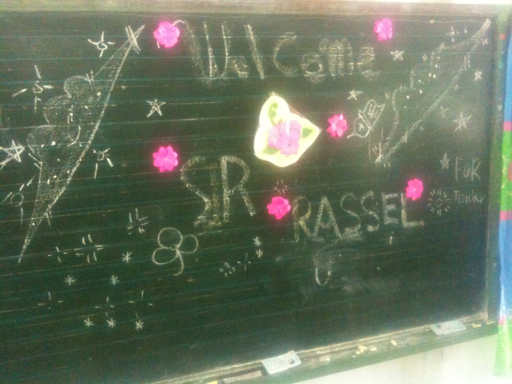 However, the kids remembered me and on their own initiative made this beautiful greeting for me on the chalkboard! Talk about gratitude and enthusiasm! The students were 100% eager to learn and listen. And grateful. At the end of the class--get this-- they all lined up to shake my hand. All 50 of them! When students are this eager what can you do? I gave them my attention the whole day and, incorporating mandala art into their current math lesson on ratios, we made the most amazing Mandalas together. 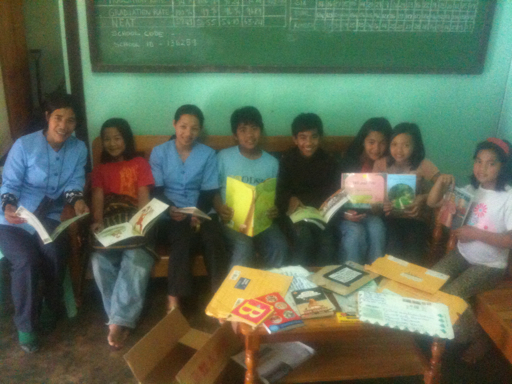 The students with all the 1Books that have arrived.